Ann is the Glorious Grasslands Project Officer, hosted by the Peak District National Park Authority, Ann works with farmers and land managers to protect, restore and enhance the South West Peak’s characteristic grassland habitats. She can be found out in the field undertaking grassland surveys during most of the summer months and at the computer writing up the results of surveys and entering data into GIS over winter. She also works with volunteers and gives guided walks to people about the importance of grasslands and the wild plants found in them. Ann has previously worked for Staffordshire Wildlife Trust, Natural England and most recently in a freelance capacity advising farmers and project managing delivery of agri-environment schemes and habitat restoration works. She currently runs a facilitation group, White Peak Farmers, where she supports a group of farmers to manage land cooperatively for wildlife through the Countryside Stewardship Facilitation Fund. 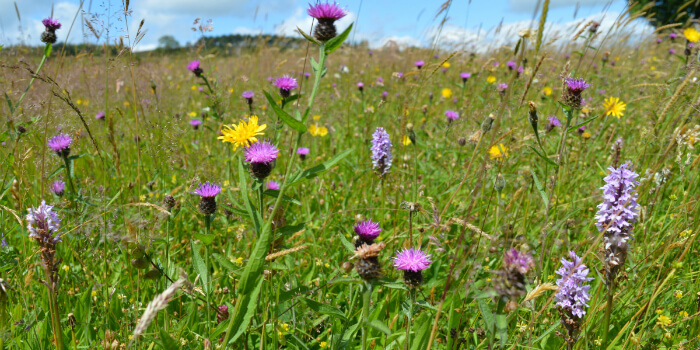 Enhancing, restoring and expanding species-rich grasslands across the South West Peak.